DOE Zero Energy Ready Home Partner - Hugh Lofting Timber Framing Inc.
Hugh Lofting Timber Framing & High Performance Building is a U.S. Department of Energy (DOE) Zero Energy Ready Home Partner. The program identifies builders who construct to DOE’s strict guidelines for zero net-energy ready homes, which are so energy efficient – at least 40-50% more than a typical new home – that a small renewable energy system can offset most or all of the annual energy consumption. 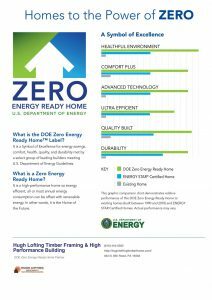 By building homes with extraordinary levels of energy efficiency, comfort, safety, health, and durability, DOE Zero Energy Ready Home partners are saving Americans energy and money, creating jobs, and protecting the environment.